Now that Wall-Ye V.I.N. has been built we can rest assured that there are no jobs too sacred to be handed over to the automated expertise of robots. Wall-Ye is a robot that takes the human touch out of caring for those grape vines that make French wines among the best in the world. Created by Christophe Millot, an inventor based in the Burgundy region of France, Wall-Ye will soon be taking on the most labor-intensive of chores performed in wine vinyards: pruning and de-suckering, or clipping off fruitless shoots. I asked Millot about Wall-Ye and how he might expect French winemakers to feel about putting the fate of their precious grapes in the hands of a robot. Decked out in white with red trim, Wall-Ye stands about 50 cm (20 in) tall, 60 cm (2 ft) wide and weighs about 20 kg (44 lbs). As it travels up and down the rows of vines six cameras are used to navigate in between, image and cut the plants. Cameras located on the top and bottom ensure that it maintains a straight path in between the vine lanes. Other cameras store the shape and, with GPS, location of every vine. A 3D model AI tells it when to cut the shoots, which it performs with a pair of camera-guided arms with clippers. Unlike its human counterparts Wall-Ye never takes a break and can work day and night to prune up to 600 vines per day. That kind of productivity is why some winemakers are eager to get Wall-Ye working despite its 25,000 euro ($32,000) price tag. But what about the purity of it all? Winemaking is an art non? Millot acknowledges that, even for French winemakers, economics trumps tradition. 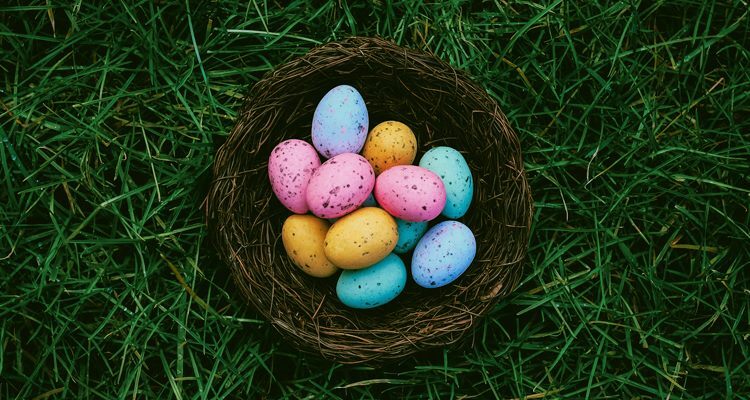 He says that there's simply not enough seasonal workers to go around. The typical vine pruners, de-suckerers and pickers are young people on school break out to make some extra cash. But the problem is in August France goes on vacation, meanwhile the vineyards still need to be tended. Moreover, inexperienced pruners have to be trained for three years before they're up to speed. It's a lot of investment that, for some, yields too little return. Inexhaustible as it is, however, Wall-Ye still can't do all the things human workers can do. As of yet, the robot can't actually pick the grapes. But Millot told me that grape picking capabilities will be added to the AI next year. "Everyone will benefit from the evolution of its brain." Not everyone is excited to replace their human hands. The owner of the Chateau du Val d'Or in Bordeaux, Phillipe Bardet, told the Daily Mail, "Technically it's interesting, but intellectually, it's inconceivable. It doesn't fit with my philosophy of making a Saint Emilion grand cru." 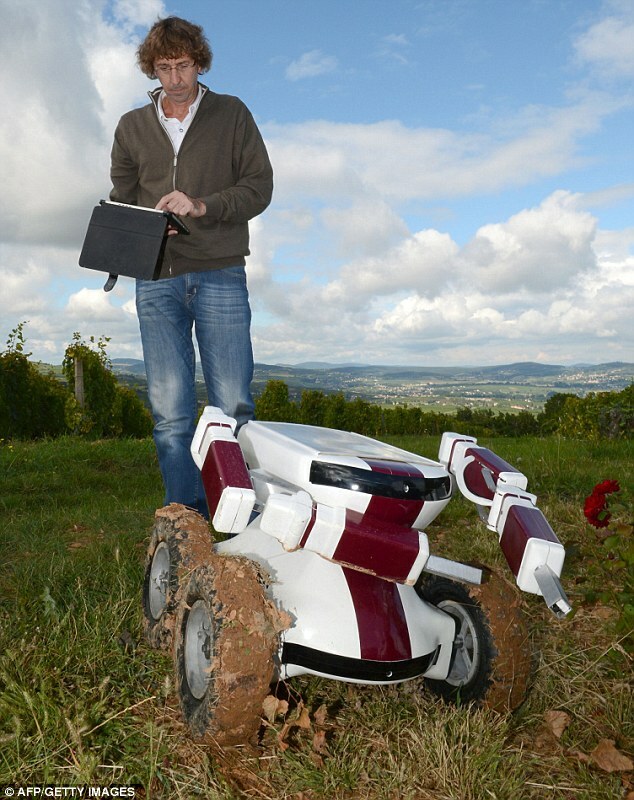 Bardet, then, won't be too happy to learn that others are developing robots to work their vineyards. California-based Vision Robotics is developing a much larger vine pruner robot and Canterbury University in Australia is developing their own as well. All three robots use similiar systems: imaging that gets fed into AI 3D modeling to determine when and where to cut. Pruning is a particularly sensitive task because it tells the vine how many bunches of grapes to produce and affects its ability to ripen the fruit to perfection. 'Each plant is unique in terms of things like vigour, so it must be treated uniquely during pruning,' said Fetzmann of Domaine Louis Latour. 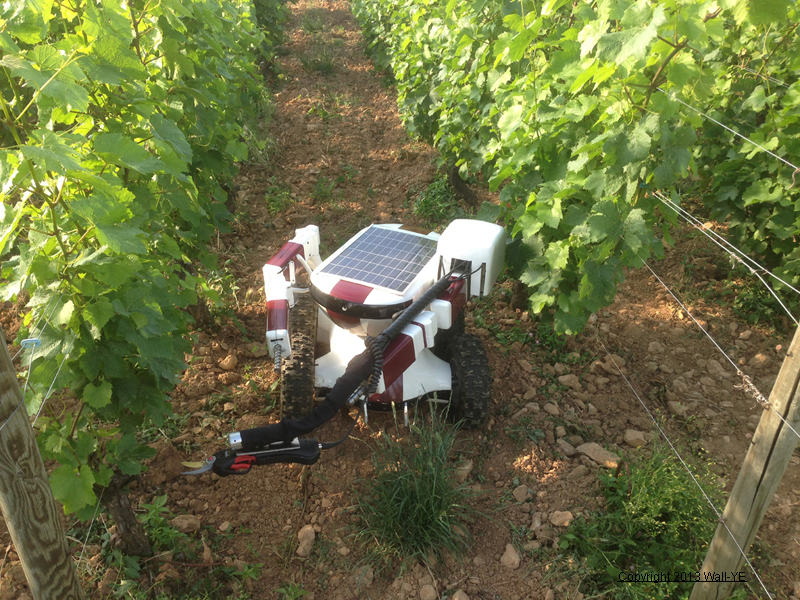 Many vintners surveyed in a straw poll by AFP considered vineyard robots to be an inevitable development. 'We once said we'd never use machines to harvest, now we do,' said Fetzmann. 'Everything that can be mechanised will eventually be mechanised.